“About the midnight hour of Thursday, the nineteenth instant, when almost all in town were knotted in the peace of sleep, deaf to all noise and blind to all danger, snoring in calm security, and seeing visions of remoteness radiant with the rainbow hues of past associations, or roseate with the gilded hopes of the fanciful future–while the fullfaced queen of night shed showers of silver from the starry throne down o’er fields of freshness and fertility, garnishing and suffusing sleeping nature wither balmy brightness, fringing the feathery cottonwoods with lustre, enameling the housetops with coats of pearl, bridging the erst placid Platte with beams of radiance, and bathing the arid sands of Cherry creek with dewy beauty–a frightful phenomenon sounded in the distance, and a shocking calamity presently charged upon us. The few who had not retired to bed, broke from their buildings to see what was coming. Hark! what and where is this? A torrent or a tornado? And where can it be coming from, and whither going? These were the questions soliloquized and spoken, one to the other. Has creation’s God forsaken us, and had chaos come again? Our eyes might bewilder and our ears deceive, but our hearts, all trembling, and our sacred souls soon whispered what it was–the thunders of omnipotence warning us “there’s danger on the wing,” with death himself seeming to prompt our preparation for the terrible alternative of destruction or defence. Presently the great noise of mighty waters, like the roaring of Niagara, or the rumbling of an enraged Etna, burst upon us, distinctly and regularly in its sounding steps as the approach of a tremendous train of locomotives. There was soon a hurrying to and fro in terror, trying to wake up one’s relatives and neighbors, while some favored a few who were already dressed, darted out of doors, a clamorously called their friends to climb the adjacent bluffs and see with certainty for themselves. Alas, and wonderful to behold ! it was the water engine of death dragging its destroying train of maddened waves, that defied the eye to number them, which was rushing down upon us, now following its former channel, and now tunneling direct through banks and bottoms a new channel of its own. Alarm flew around, and all alike were ignorant of what to think, or say, or do, much less of knowing where to go with safety, or to save other. A thousand thoughts flitted o’er us, and a thousand terrors thrilled us through. What does this mean? where has this tremendous flood or freshet, this terrific torrent come from? 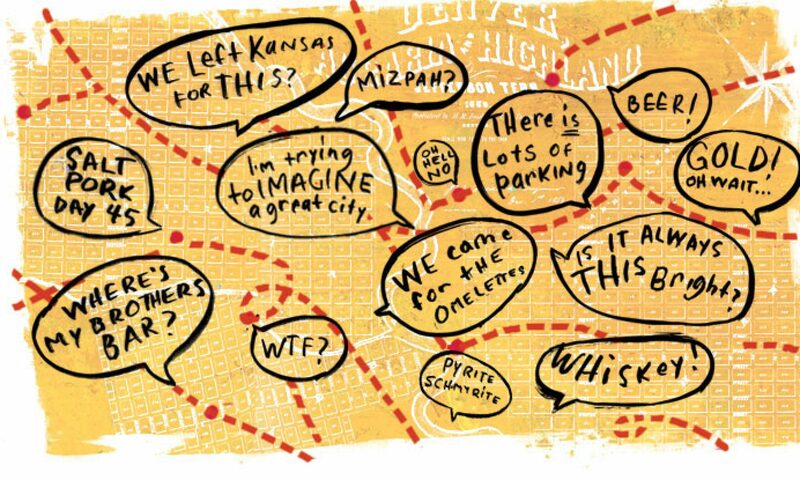 Has the Platte switched off from its time-worn track and turned its treasure down to deluge us? Have the wild waterspouts from all the clouds at once conspired to drain their upper cisterns, and thus drench us here in death? Have the firm foundations of the Almighty’s earth given way, and the fountains of the great deep burst forth on fallen men, regardless of that rainbow covenant which spanned in splendor yon arc of sky last evening? Is the world coming to an end, or a special wreck of matter impending? These, and thoughts like these, troubled the most fearless souls. Now the torrent, swelled and thickened, showed itself in sight, sweeping tremendous trees and dwelling houses before it–a mighty volume of impetuous water, wall-like in its advancing front, as was the old Read Sea when the Israelites walked through it and volcano-like in its floods of foaming, living lava, as it rolled with maddened momentum directly towards the Larimer street bridge and gorged afterwards rebounding with impetuous rage and striking the large Methodist church and the adjoining buildings, all of which it wrested from their foundations and engulphed in the yawn of bellowing billows as they broke over the McGaa street bridge. Like death, leveling all things in its march, the now overwhelming flood upheaved the bridge and the two buildings by it, Messrs. Charles & Hunt’s law offices, in the latter of which C. Bruce Haynes was sleeping, whom, with the velocity of a cataract, it launched asleep and naked on the watery ocean of eternity, to find his final, fatal refuge only in the flood-gate port of death! Poor Haynes! Your summons came, but ’twas short and sudden, after and not before you had “wrapped the drapery” of your humble couch about you, and had lain down to “pleasant dreams.” Precipitately and in paroxysms the tempestuous torrent swept along, now twenty feet in the channel’s bed, and bridging bank to bank with billows high as hills piled upon hills–with broken buildings, tables, bedsteads, baggage, boulders, mammoth trees, leviathan logs, and human beings buffeting with the billowcrests, and beckoning us to save them. But there we stood, and there the new made banks and distant bluffs were dotted with men and families, but poorly and partly dressed deploring with dumb amazement the catastrophe in sight. 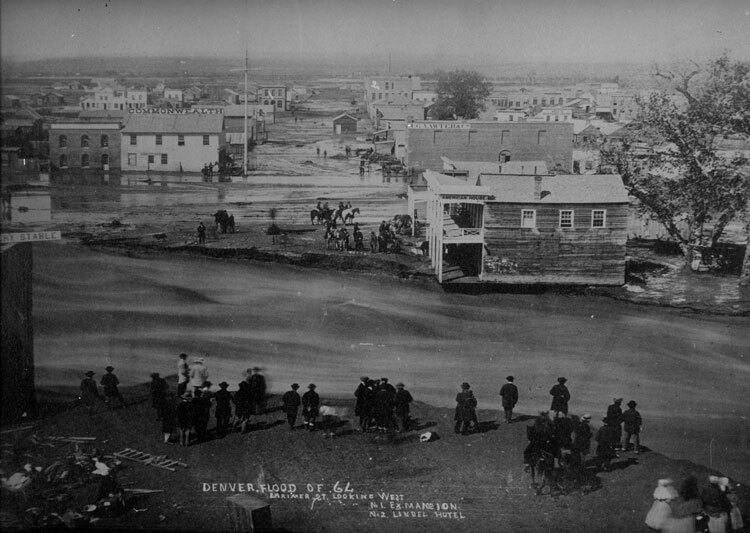 The waters like a pall were spreading over all the inhabited lower parts of town and townsite. Nature shook about us. The azure meads of heaven were darkened as in death, and the fair Diana with her starry train, though defended by the majesty of darkness all around her, and by batteries of thick clouds in front, looked down on shuddering silence dimly, as if lost in the labyrinth of wonder and amazement the volume of the vast abyss into which we all expected to be overwhelmed. Next reeled the dear old office of the Rocky Mountain News, that pioneer of hardship and of honor, which here nobly braved the battle and the breeze for five full years and a month, regularly without intermission or intimidation, and down it sank, with its union flag staff, into the maelstrom of the surging waters, soon to appear and disappear, between the waves, as, wild with starts in mountains high, they rose and rolled, as if endeavoring to form a dread alliance with the clouds, and thus consumate our general wreck. Before this a few moments, one of the proprietors, Mr. J. L. Dailey, and four of the young gentlemen employees, who had been asleep in the building, awoke to realize the peril of their critical situation, and without time to save anything at all in the whole establishment, not even their trunks at their bedsides, or watches on the table-stands, they fortunately escaped, by jumping out of a side window, down into the eddy water caused by a drift which had formed against the building, and thence by the aid of ropes and swimming, struck the shore, on the instant of time to see the sorrowful sight of their building, stock, material, money, all, even to the lot on which it stood, (for which all $12,000 would have been refused a few hours previously), uptorn, and yet scattered to the four winds of heaven or sunk, shattered in sand banks between her and the States. Oh! it was indescribably and inconceivably awful to behold that spectacle of terrible grandeur, as the moon would occasionally shed her rays on the surges of the muddy waves, whose angry thundering drowned all other noise, and to hear the swooping of the death angel as he flew o’er the troubled surface, suggesting the idea of death and destruction in the wild tumults of the torrent! For about five hours, up to daylight, the floods in Cherry creek and in the Platte were growing gradually, spreading over West Denver and the Platte bottoms in the eastern and western wards of town, divided by Cherry creek, and bounded westerly by the then booming Platte. For squares up Cherry creek, on either side of its old channel, and along to its entrance into the Platte, the adjoining flats were inundated, and the buildings thereon made uncomfortable if not unsafe by the amount of water carpeting their floors to a depth of from one to five feat deep. Blake street was covered to a foot in depth in water with mire, and the basements of many of its stores were solid cisterns of muddy water. From the Buffalo House to the site of F street bridge, on the East Denver flats, was one shining sea of water. Most of the settlers had to leave their homes and household goods, and made up town to escape the inundation. The same was the case with the majority of the citizens on the west side also. There it was still deeper and more dangerous, and there, too, it proved more destructive to the residents and residences. Scores and scores of the families from Camp Weld, along down the foot of Ferry street and thence southwesterly to the old site of Chubbuck’s bridge, were surprised in their sleep, and surrounded by an oceanic expanse of water from the overflowing Platte. Many found their floors flooded from three to six feet deep with water before they knew it, or had waking warning to escape for their lives, and gladly leave the frame structures and their furniture and fixtures to float down the flood. ‘Twas here that the most sever and serious losses and privations were encountered. ‘Twas here, West Denver, along Front street, Fifth street, Cherry street, and Ferry, as well as all over the streets of the southwestern bottoms, that the gallant officers and men of the Colorado First, together with several of the citizens, showed their timely presence and their truly great assistance, rescuing families from their flooded homes, and removing them on horeseback and otherwise, to distant dwellings high and dry. During this time, which lasted a few hours, commencing about daylight’s dawn, the scenes of sorrow and of suffering should have been seen to be appreciated, to draw forth due gratitude to the rescuers for the self-sacrifice they showed. Many of the families, women and children, had to flee in their sleeping habiliments, having neither time nor inclination to squander in search of their “good clothes.” Thanks and remembrances eternal to all of those active, noble souls on the several sides of town who worked from the noon of night to next noonday assisting the sufferers and aiding the citizens in all good efforts and good works. ‘Twas not till daylight that the chocked up Cherry creek completely spread itself and formed independent confederations, one stream running down Front street, deep and impetuous enough to launch a good-sized building from its foundation; another down Cherry street, conclusively gutting the street and blockading the dwellings’ doors with “wood and water” up almost to their very lintels. On Ferry a lively river flowed, five and more feet deep, with a current strong enough to make a Hudson river steamer hop along its waves. The Ferry street and F street bridges fell early in the flood, and the erosions in the estuary at the latter entirely changed the river’s bed, forming a new cycloidal channel nearly an eighth of a mile to the westward. The same freaks were exhibited by Cherry creek during its twelve hour lunacy, leaving the old time bed, and breaking another farther north, by undermining the bluffs, and excavating and upheaving old alluvial mounds without ceremony. Now this celebrated creek resembles a respectable river, with a prospect of a perpetual, flowing stream throughout the year, instead of selfishly sinking in the sands some miles above, as heretofore. Its having defined its position and established its base for future operations, will prove a good thing to the town eventually, notwithstanding it falls heavily on hundreds for the present. For a few days previous, there was an abnormal amount of rain at the heads of Cherry creek and Plum creek, along the water-shed range of the divide, so much so that it terrified tillers of the soil, and threatened their cultivated fields with failure. On Thursday afternoon it rained there incessantly, so that the natives knew not whether the cistern clouds had lost their bottoms, or had burst asunderal together. It would shower hail-stones as large as hen’s eggs one hour, and during the next hour it would literally pour down water-spout sheets of rain from reservoirs not over two hundred feet above, while a few minutes more would wash the hail away, and leave four feet of water on the level fields. And this ponderous downpouring was so terrible that it instantly inundated and killed several thousand sheep and some cattle that were corraled at ranches in the region. This phenomenon will plausible prepare us to believe that the “dry cimarron” beyond Bent’s Fort, the Ocate, the Pecos, and large but partially dry aroyas of New Mexico were formerly what the “exaggerating” mountaineers have heretofore assured our infidel minds were but stubborn matters of facts. Even at this present writing, and in our own immediate neighbor hood, it will not be believed what startling changes have been made by the alluvial developments of last Friday, unless you have your auditors accompany you to the theatre of the tempestuous flood, on Cherry creek and elsewhere, so that seeing becomes believing. The spirit of departed day had joined communion with the myriad ghosts of centuries, and four full hours fled into eternity before the citizens of many parts of town found out there was a freshet here at all! Whether it was caused by “deep sleep falling upon men,” or by the concentrated essence of constitutional laziness, there were many made aware of the awful risk they ran by sleeping sluggard-like, after frequent rousings, not only later than the hour of dying twilight after the advent of the goddess of the morning, but even after Sol’s bright beams had dispelled the dark and shown the awful escapes that all had run from the delugic danger, Some sons of men and women will not be made to move unless folks, Gabriel-like, will blow a trumpet through and through their ears, bedress them in their beds, and bewilder them into the belief that an ocean of old rectified poison will encircle them if they don’t start! Of the thousands and one incidents, actual and exaggerated, that have been borne on the breeze of rumor since the flood, we shall mention here but few, since they would not prove of any special interest to our readers at a distance, for whose satisfaction this cursory sketch was scribbled. The fortunate finding alive of the you man Schell after buffeting the billows for three miles, the heroic and happy escape of Martin Wall, after encountering the distress of a deck passage on the jail roof for and equal distance, and the remarkable presence of mind and power of perseverence show by the colored woman, Mrs. Smith, while tossed on the waters with her family of five children for a couple of miles, afterwards effecting a safe landing place for them and her till morning, are deserving the pen of an Irving to only do them justice. The perilous condition of Mr. Wm. N. Byers and family, also, together with the considerate coolness displayed by them while dangerously surrounded, would deserve no less congratulatory mention than the kind efforts of Gov. Evans, Col. Chivington, and those skiff-constructing soldiers would demand a corresponding complimentary one. Of the various persons who proved themselves kind and humane to assist, it would be invidious to individualize, where each did all he could. C. Bruce Haynes, late of the Quartermaster’s office, Gumble Rosebaum, clothier, Otto Fisher, (four years old), Henry Williamson, who herded stock for General Patterson down the Platte, a woman and two children from up Cherry creek, a woman and two children from Plum creek, and a Mr. and Mrs. I. R. Tyson and two children. August Metz, of Blake street bridge, who was carried along with the torrent eighteen miles to Henderson’s Island, is the only person found whom we have yet heard of. Among the heavy sufferers in property are Byers & Dailey, publishers of the Rocky Mountain News, who lost their entire all, with the building and the lot it stood on, A. E. & C. E. Tilton, house, lot and $6,000 worth of goods damaged; also, F. A. Clark, Gen. Bowen, Wm. McKee, Mr. Charles, Messrs. Hunt, Metz and others, lost all they had in store or office, together with the buildings, and sand substracted lots on which they stood. Esquires Hall & Kent lost nearly all of their office books and papers. The probate records, city records, commissioner’s court and the city safe itself, all, all are gone, and whither the deponent saith not. In the country, Messrs. Gibson, Arnold, Schleier, Lloyd and Stoner, ranchmen, and scores of others, lost stock, and had their well-trimmed farms desolated into wastes of sand and gravel. D. C. Oakes lost his saw mill, part of which was impelled down the current for a few miles. Messrs. Reed, Palmer and Barnes lost, collectively, over four thousand sheep off their ranches up Cherry Creek. _ There have been portions of the heavy machinery of the News office found fast and deep in sand-bars, several miles down the Platte. The strangeness of the fact of machinery moving so far distant in a watery current, will be lessened by remembering that. One good effect of the flood was the washing away of all that remained in the shape of hostile or sectional feeling between the east and west divisions of the city. 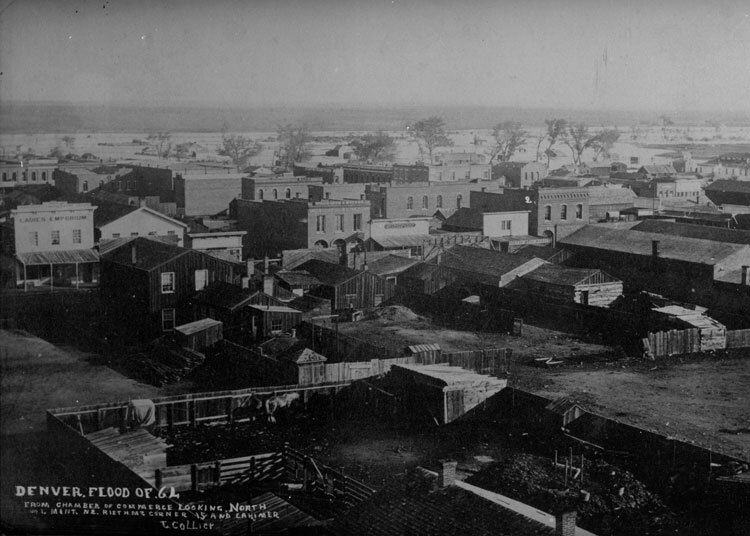 It also put a stop to all building on the treacherous sands of Cherry creek, and as West Denver being on the lowest ground suffered most, it subsequently led to the abandonment of many of its business houses, the proprietors establishing themselves in new places in the east division of the city, which rapidly acquired prominence and importance. Many frame residences for the three years following the flood were removed from the west to the east division of Denver. The proprietors of the News office bought the office material and subscription lists of the Commonwealth and resumed the publication of their paper in about a month after the inundation. Their office was opened in the Murdock building, on Larimer street, now owned by Deitsch Brothers and occupied as a billiard room by Count Murat. Here it remained until the erection of the News building, near the corner of Larimer and G streets, in the fall of 1866, where the office is now permanently located. B50 Note: O. J. Goldrick, commonly called “The Professor”, was Denver’s first schoolteacher and a writer for the Denver Rocky Mountain News. Photographs by J. Collier, from the collection of Byron Hooper. Thanks to everyone here who has made this site possible! I just stumbled on it this morning and am really enjoying all of the great stories and pictures. Really, this is great, thank you! Fabulous post. Just discovered that my great-great grandfather was one of the “young gentlemen employees” asleep in the News building. What a great site. This is a neat site! Thank you for the cool information, especially the pictures. I read that the City Hall that held all the Denver land deeds was washed away, including all the records. Do you know where a deed office was established after the floods to record new deeds? The poetic verse used in the newspaper article describing the Flood of 1864 is quite amazing. Not only was the event historic but the description of it holds a certain weight and measure itself – exposing how much newspaper journalism has changed.